Terms are an important part of any reward program, as these conditions ensure your members know what to expect out of a reward they redeem and allows you to have control over exactly what you are offering. Include relevant terms on every reward you create. If you are running your program in-store, this can be used to encourage members to shop in-store. However, all rewards are redeemable online, if you have an eCommerce store. This term is simply a handy way to guide people in-store. This term isn't always necessary, as customers can only use one discount code at checkout at a time. This is set by Shopify to prevent discount stacking. However, you may wish to use it to ensure you are protected against any pushy customers. 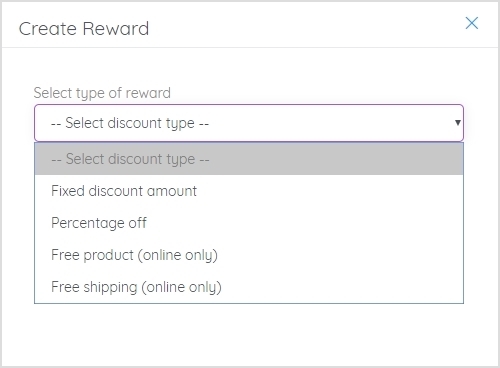 To be used with free product rewards or discount on a specific product rewards, where a product has to be added to the cart in order for it to be discounted. This can be a handy term to include in spend threshold rewards. Also, be sure to include it in your reward title, e.g. $20 off orders over $100. Incentivize members to redeem rewards soon by creating urgency with a limited-time offer. Let members know that there is an expiration on the reward, this will incentivize them to use it soon, and also prevent them from being disappointed by it expiring. When reward discounts only apply to a specific product collection, reiterate this in the terms to minimize confusion when members redeem it. Your terms will now be live on your store loyalty widget. These terms are visible when a member views a reward, redeems a reward, and are sent in their reward coupon email (if you have this email enabled under Email Notifications).